Update: January 10, 17:00 UTC – United Launch Alliance has abandoned Wednesday’s planned NROL-47 launch attempt due to unfavorable weather. Keeping with the theme of classified spaceflight business, this will be the second launch in just five days involving a classified primary payload after a SpaceX Falcon 9 rocket lifted the top-secret Zuma satellite Sunday night. ULA and the NRO will be hoping for a better outcome as reports emerged that Zuma was likely met with an untimely demise shortly after arriving in orbit. As with every National Reconnaissance Office mission, the launch comes without much public information. To that end, the duration of Thursday’s launch window and any information on what is hidden under Delta’s payload fairing are closely guarded secrets, as is the mission’s target orbit. Live coverage of the launch will end less than four minutes after launch when Delta IV will separate its protective payload fairing and push toward orbit out of public sight. Unlike Zuma whose secrecy apparently outlived its mission, NROL-47’s identity can be revealed with fair certainty before it even launches due to the unique “backwards” orbit it is targeting as shown by the launch hazard area published for Thursday’s mission. This type of retrograde orbit, inclined >100°, is only used by the radar satellite program of the National Reconnaissance Office which has seen four launches to date. The first FIA Radar Satellite launched in 2010 as NROL-41 on an Atlas V 501, the next two followed in 2012 and 2013 as NROL-25 and 39 on Delta IV M+(5,2) and Atlas V 501 rockets and the fourth, NROL-45, took flight in 2016 on a Delta IV M+(5,2). To date, the Delta IV M+(5,2) has exclusively been flown in support of the Topaz program, adding further confidence that Thursday’s launch will be lifting the next member of the constellation. 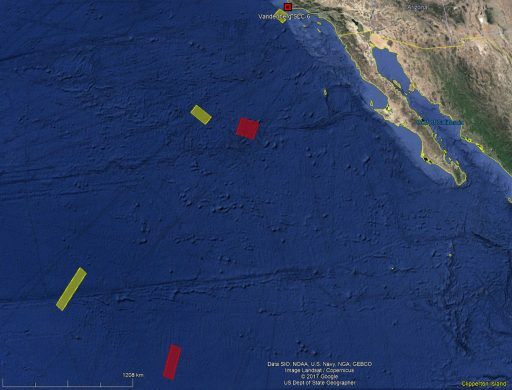 Orbital data collected by amateur satellite trackers shows the four Topaz satellites in orbits of 1,100 by 1,105 Kilometers at an inclination of 123 degrees with a separation of roughly 90 degrees in right ascension between the four constellation planes. 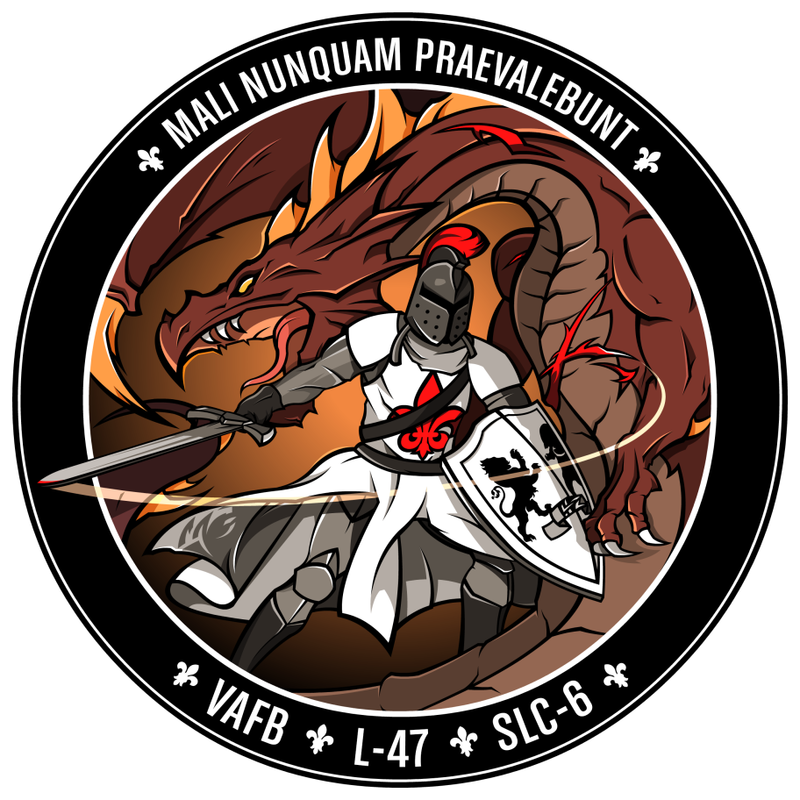 Vandenberg Air Force Base will be in the orbital plane of Topaz 1 (NROL-41, USA 215) at 21:15 UTC on Thursday, coinciding with the opening of the launch window and indicating NROL-47 may be the replacement for the oldest member of the system. However, one departure from the previous pattern is found in Thursday’s launch azimuth which can be gleaned from the official Notices to Airmen identifying the hazard areas associated with the mission – pointing to a 109-degree inclination as opposed to previous missions whose azimuth pointed directly to a 123-degree orbit. To reconcile the launch azimuth with the given second stage re-entry area for Thursday’s launch, an orbital altitude around 400 Kilometers above the existing Topaz constellation is indicated. This would either place doubts on the satellite’s identity as Topaz-5 or imply that it is headed into a different orbit than its predecessors. According to leaked documentation, there were to be five Topaz Block I satellites and NROL-47 is the only candidate that fits (it is the final launch of the Delta IV M+(5,2) and the Atlas V 501 only has one manifested mission with the X-37B OTV-6). The change in orbit may be motivated by a desire to exploit peculiar harmonics arising from Earth’s geopotential that can influence the progression of orbital eccentricity and inclination over time. 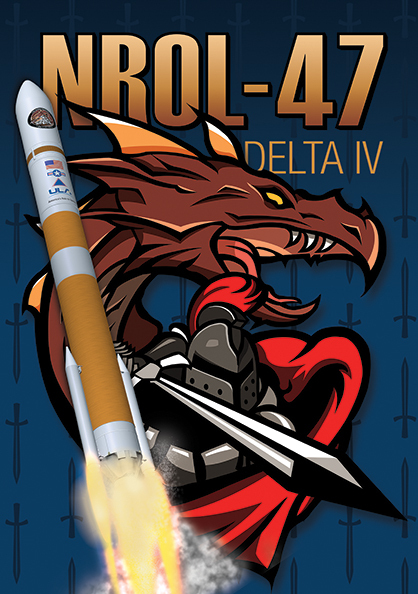 Preparations for the launch of NROL-47 started back on April 6, 2017 when the Delta Mariner delivering the components of the Delta IV rocket was unloaded at Vandenberg Air Force Base dock. 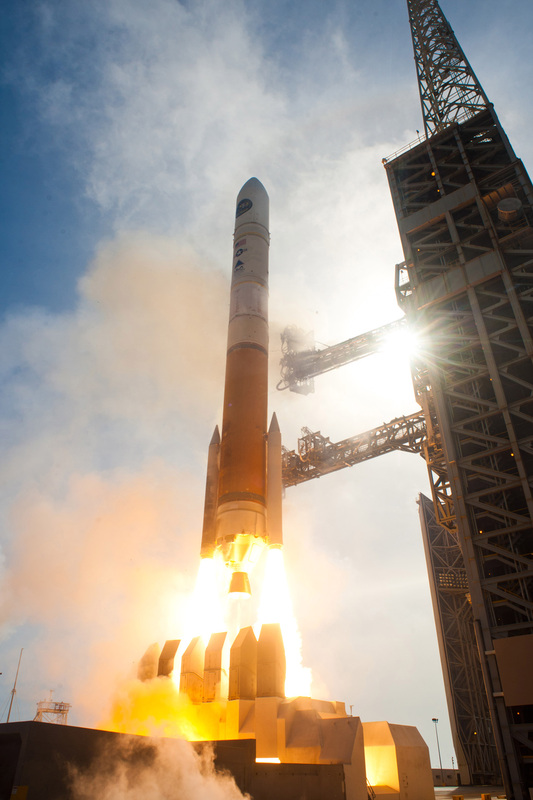 The launch was initially set for December 13, but ULA decided to delay the mission “in order to perform additional validation of the software and systems associated with Common Avionics” – a newly designed avionics flight system, software and ground support architecture for both Atlas V and Delta IV intended to increase commonality between the two launch vehicle families and reduce cost. 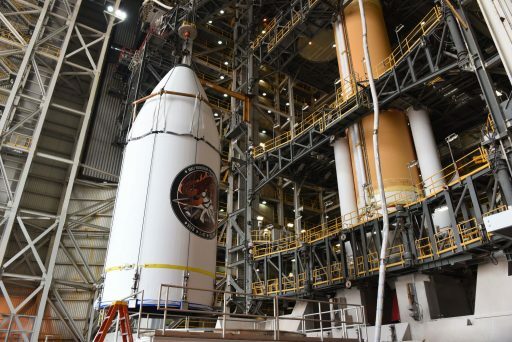 Thursday’s mission will be the last Delta IV Medium, or single-stick Delta IV, to fly from Vandenberg as ULA shifts toward its new Vulcan rocket that will eventually take over for Delta IV and Atlas V with the more-expensive Delta family being the first to retire. 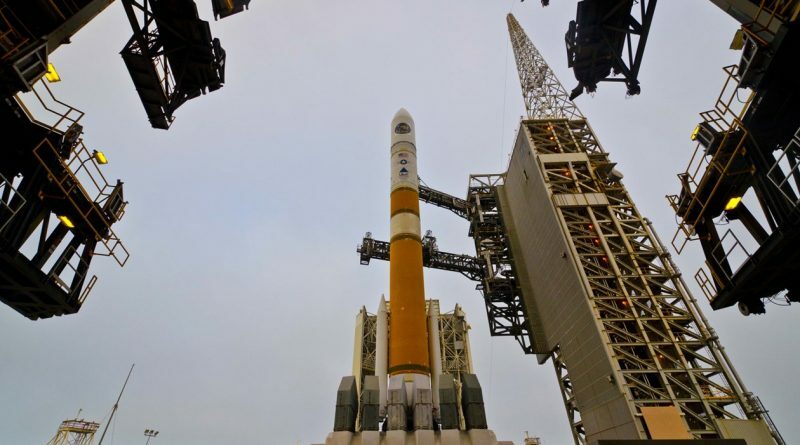 ULA will fly out its Delta IV Medium inventory this year and only keep the Delta IV Heavy rocket in operation through 2023 for six NRO missions and the deployment of NASA’s Parker Solar Probe. Weather for Wednesday’s NROL-47 launch opportunity was less than ideal with only 30% odds of favorable conditions during the classified launch window due to gusty winds up to 28kts. Countdown operations were started as planned, but winds did not allow the Mobile Service Tower to be retracted from the rocket per safety rules and ULA decided to defer to Thursday’s backup window that is showing a much better weather outlook with only 10% probability of violation. Delta IV countdown operations will be initiated Thursday morning, local time, when the Mobile Service Tower will be retracted to reveal the 66-meter tall rocket atop its SLC-6 launch pad. 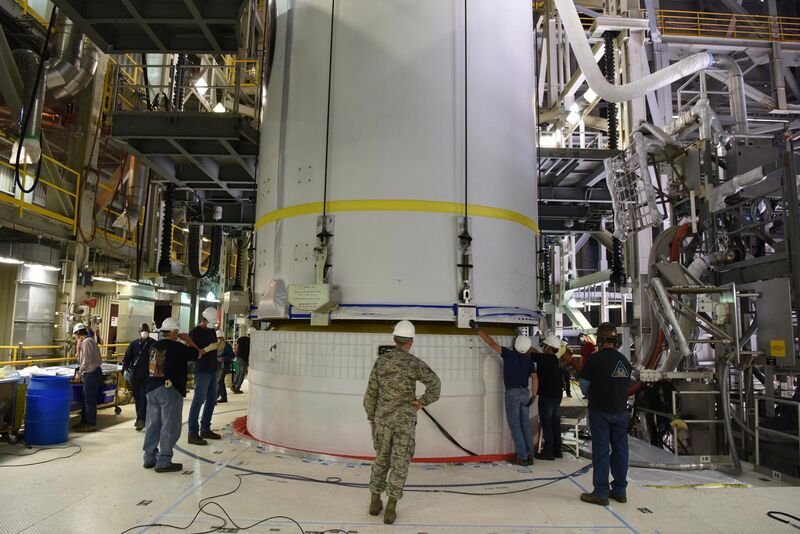 RIFCA, the Redundant Inertial Flight Control Assembly, will be activated and put through detailed checks while teams at the pad finish buttoning up all facilities for liftoff and Air Force Range Controllers begin watching over the launch corridor. Propellant loading operations pick up around L-4.5 hours to fill the two-stage rocket with supercold Liquid Oxygen and Liquid Hydrogen propellant with the first stage receiving 202 metric tons of the cryogenic propellant combination and the five-meter second stage is loaded with 27,220kg. When entering the final hour of the countdown, Delta IV will complete engine steering checks and receive an optimized version of its flight software as teams proceed into a final hold of the countdown at T-4 minutes for a status check prior to committing to terminal countdown operations. 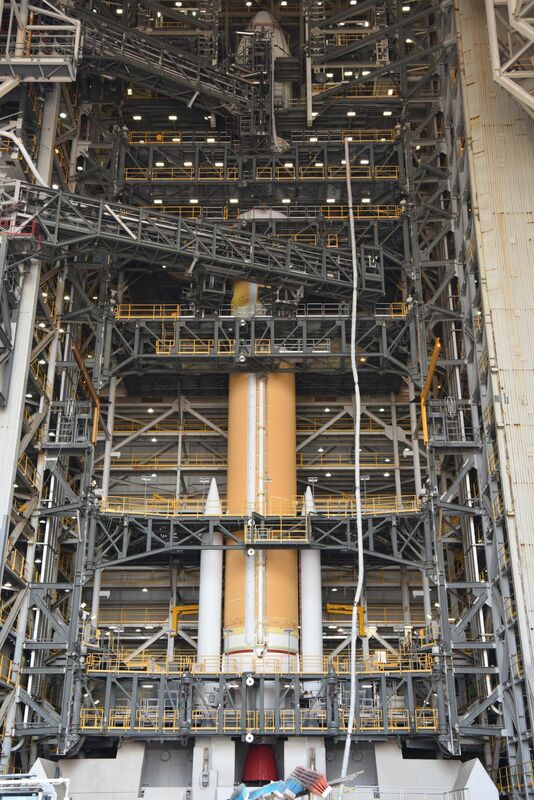 Pressing into its automated countdown sequence, Delta IV will make its way to internal power, pressurize its propellant tanks and set up its hydraulics system. A final thrust vector check on the boosters occurs at T-25 seconds and is followed by the ignition of the sparklers beneath the main engine and the handoff of control to the Delta IV rocket at T-8.5 seconds. The typical red flame of Hydrogen will erupt from the base of the rocket at T-5.5 seconds when the powerful RS-68A engine opens its fuel valve to begin its ignition process followed by the opening of the LOX valve at T-2 seconds to enable the engine to soar to a whopping thrust of 320 metric ton force. Following liftoff, Delta IV will complete a short vertical ascent before beginning its Pitch & Roll maneuver at T+8 seconds to align itself with its planned launch trajectory, departing California’s Central Coast to the south-west for a flight across the Pacific Ocean. Continuing powered ascent on the RS-68A engine of the first stage, Delta IV will keep on racing downrange on its way uphill, headed to an elliptical parking orbit. Fairing separation occurs a little over three minutes after launch, splitting open the fairing halves and rotating them outward before separation to ensure both halves cleanly depart the vehicle that will be flying through the rarefied layers of the atmosphere by that point where thrust on the RS-68A increases to 363 metric ton-force. The Common Booster Core will burn until close to T+4 minutes followed by stage separation six seconds thereafter. The RL-10B engine of the second stage will then deploy its nozzle extension and ignite on the first of two burns to boost the stack into orbit with a thrust of 11,200 Kilogram-force. This first long firing of the DCSS will place the stack into an elliptical transfer orbit with an apogee at the desired orbital altitude. Next will be a coast phase to allow the second stage to climb all the way to apogee for the circularization burn to set up for spacecraft separation around 90 minutes after launch. The Delta Cryogenic Second Stage will conduct a retrograde deorbit maneuver to set up a destructive re-entry over the Southern Indian Ocean for impact in an area south of Madagascar / South Africa some three hours after launch. 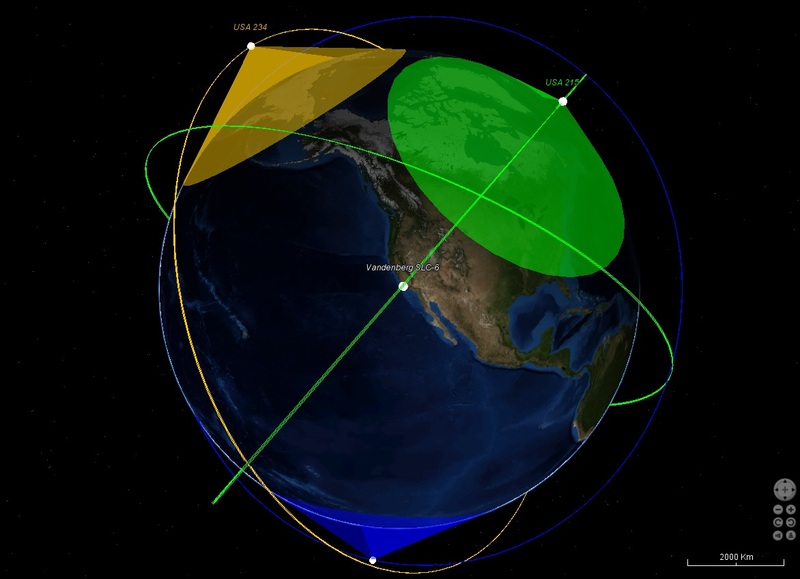 Pending the successful launch of NROL-47, satellite trackers around the world will spring into action to observe the satellite in orbit and get a fix on its orbital parameters to ascertain whether the satellite, expected to be cataloged as USA 261, will indeed enter a different orbit than its predecessors and what the precise motivation behind this change could be.